Halle / KarlsruheThe challenges of Industry 4.0 and IoT require all future industry devices and solutions to become communicable. On one hand, IT requirements are increasingly merging with factory automation, on the other hand, processes and procedures demand "real-time" capable communication possibilities.The realtime communication platform GOAL, developed by PORT, offers scalable multi-protocol solutions such as PROFINET, EthernetIP, EtherCAT, CANopen, PROFIBUS and ModbusTCP. Extensions like DLR (device-level-ring) are also available, depending on the type of processor.EMTRION will integrate GOAL into its products and offer it optionally. Ramona Maurer (CEO, EMTRION): „In cooperation with PORT, we are taking a major step towards IoT and Industry 4.0 applications. As GOAL royalties can be supplied optionally for every embedded hardware, the entry barriers for our medium-sized customers are very small.Particularly interesting are the protocols available on an embedded module, such as PROFINET, EthernetIP, EtherCAT, MODBUS TCP and CANopen. "Dietmar Franke (CEO, PORT): „With GOAL, we offer a cost-effective entry into the world of real time communication technology. So far, high investments and complex third party management was necessary to integrate the main market-leading real-time logs into customer devices. In conjunction with GOAL, EMTRION can now offer a scalable solution. One piece of hardware - many real-time communication solutions.“EMTRION and PORT continue providing a very helpful tool chain (design tools) for simple and efficient configuration of fieldbus systems. GOAL – (Generic Open Abstraction Layer), is a sophisticated Middle-Ware to integrate Real Time Communication in IoT and Industrie 4.0 applications. GOAL offers a sophisticated “Network Management” (PHY Management, Ethernet frame sending/receiving, Switch Management with CLI, Interface Management, IP Address Management (if supported by underlying OS and TCP/IP stack), HTTP Server and more. Extensions, such as DLR, IEEE1588, RSTP, 802.x, Profibus DP are available as well. All options are available for the following MCU platforms by Renesas: RZN, RZT and RIN32M3. The scalability of the GOAL middleware enables the use of GOAL with various platforms. GOAL is being supported by useful Design Tools. The product is being licensed as Product-, Project- or optional Site - License. For certain business cases a Royalty based License model can be defined. Düsseldorf, Halle - October 22, 2015 - Renesas Electronics Europe, a premier supplier of advanced semiconductor solutions, and port GmbH today announced the availability of a highly efficient CANopen protocol stack for Renesas' smart 32-bit RX231 MCUs. Renesas ported the widely used and popular CANopen software stack in cooperation with its business partner port GmbH. The embedded CAN module on the RX231 includes 20 buffers, 16 of which can be programmed to be shared between receive and transmit functions, creating 2 receive FIFO's and a transmit FIFO. A powerful acceptance filter selects which messages to receive according to 16 receive rules allowing the user a great deal of flexibility in creating incoming message handling strategies. The CAN modules can interact with Renesas' RX CPU by using different interrupts such as reception complete, transmission complete, receive FIFO, transmit FIFO, and error interrupts. "Amongst the other available industrial communication protocols, CANopen remains a market leader especially in the fields of industrial automation and medical applications where an easy manageable protocol with a small memory footprint for reliable low bandwidth communication is essential," said Bernd Westhoff, Manager of the Global RX Product Marketing team of Renesas Electronics Europe. "The widespread popularity of CANopen in those applications is supported by Renesas' latest 32bit RX231 MCU with embedded CAN interface. These RX MCUs, combined with the well-known CANopen stack supported by port GmbH, provide an excellent foundation for fast and smart development using the powerful embedded CAN interfaces." Further PORT GmbH offers CANopen training, integration workshops and "be up to date" service maintenance agreements. port is one of the leading providers of industrial communication technologies with emphasis on CAN/CANopen. Since 1990 port has been situated in Halle (Saale) Germany and for five years port has successfully established a position in the area of Industrie 4.0 - industrial Ethernet technology (PROFINET, EtherCAT, POWERLINK, EtherNet/IP). Apart from stacks, tools, trainings and integration support port offers customer specific hard- and software development, including the manufacturing of electronic devices and systems. Renesas Electronics Europe, with its business operations centre located in Dusseldorf, Germany, is a wholly owned subsidiary of Renesas Electronics Corporation (TSE: 6723). As the world's number one supplier of microcontrollers and a premier supplier of advanced semiconductor solutions, Renesas supports customers get their products to market quicker by providing complete solutions that integrate microcontrollers and microprocessors, SoC, ASIC, Analog & Power devices and software. Renesas was established in 2010 and is headquartered in Japan. With over 800 hardware and software alliance partners worldwide it has the industry's largest local support network. Renesas Electronics' European structure is comprised of two business groups - automotive and industrial - as well as the global ADAS solution group and the engineering group. The engineering group consists of the European Design Centre, the European Quality Centre and the European Technology Centre, which design leading-edge products specifically for the European as well as the global market and provide technical support to local customers. 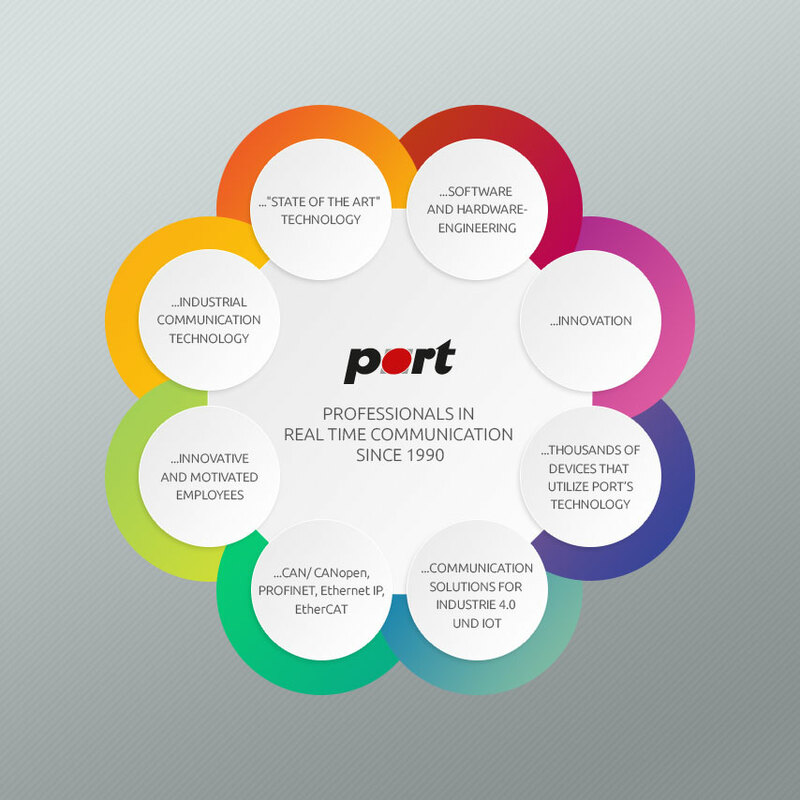 The name PORT GmbH is connected with rugged and reliable Industrial Communication – since 25 years now. Regardless of the age – PORT is an innovative, technology driven company. PORT is developing Fieldbus Technology since 1990. Being among the earliest adopters of CANopen Fieldbus Technology (driven by the CiA, CAN in Automation) – PORT can claim to have significantly contributed to the success of CANopen. PORT is today among the leading suppliers for CAN open Protocol Libraries and corresponding Tools. Our customer base is the best reference, although we cannot say for sure how many devices are using our stack; however: We know it’s MANY. We stick to our philosophy for 25 years now – Protocol Libraries and Tools are independent from the platform (MCU, CPU) and are offered in different product ranges. A platform specific driver is the interface. Performance and price of a MCU or CPU are these days not the show-stopper anymore. Our customer decides according to his application and prevents dependencies. PORT supports around 100 platforms – from us arise no dependencies! In 2009 significant changes happened: The founders Heinz-Juergen Oertel and Hartmut Tietz sold the company’s shares to Marcus Tangermann and Christian Bornschein. New technologies came on board, new markets are being served – PORT evolved. The new owner added new business segments: Protocol Libraries and Tools for PROFINET, EtherNet/IP, EtherCAT and POWERLINK while maintaining CANopen. The company grew in short time to employ 20 Engineers. Beside Software Development Service – Hardware Development Services are provided as well. The new Industrial Ethernet Multi-Protocol solutions by PORT are today a significant business segment of PORT. The investment in the new technologies and the activities to penetrate the market paid off. Industrial Ethernet changes the market requirements and influences applications. Internet of Things (IoT) and Industrie 4.0 are changing the market for Industrial Automation, drive the Technology further and demand new business model – PORT is prepared. PORT is a popular and reliable Technology Partner – for the Semi-Conductor manufacturers AND for the Device Manufacturers. Adding another Business Segment to the Protocol Libraries and Tools – PORT is rendering Software and Hardware Engineering Services and is available to run complete OEM developments. PORT: Know-How, Innovation and Future-Proof Thinking – since 25 years. PHYTEC (Mainz) and port (Halle) expand their embedded systems portfolios with an integrated industrial communication technology offering supporting the PROFINET and EtherNet/IP..
Düsseldorf / Halle a.d. Saale, 13 October 2014 – Renesas Electronics Europe, a premier provider of advanced semiconductor solutions, and its Alliance Partner port GmbH today announced efficient multi-protocol connectivity solutions for PROFINET (CCA / CCB RT1), Ethernet/IP and CANopen stacks, as well as the associated design tools for the RX64M. The RX64M is Renesas’ 32-bit high-performance microcontroller group. Working with its Alliance Partner port GmbH, Renesas has ported the widely adopted PROFINET, Ethernet/IP and CANopen software stack to its latest RX controller. The RX64M provides a universal platform for implementing leading field bus and communication technologies. It offers generous RAM of up to 512 KB, up to 4 MB of embedded flash, up to three controller area network (CAN) interface channels and two integrated Ethernet MACs. The new multi-protocol solution now expands the stacks available for the RX64M group with the addition of CANopen, PROFINET (CCA/CCB RT1) and Ethernet/IP. Solutions for EtherCAT and POWERLINK are also available as an on-demand option. The solution ensures that the Renesas RX64M product group is tailored to applications in the manufacturing, automation and process industries. The multi-protocol approach enables the RX64M group to cover all the major global communication technologies. The new RX64M group comprises 112 products that all include high-speed flash memory clocked at 120 MHz. They are based on the new RXv2 CPU core, which is a trendsetter in its class with its 4.25 CoreMark/MHz performance. Along with its high level of real-time processing power, the RX64M also includes up to 4 MB flash and 512 KB RAM, which are required for today’s industrial electronic and network devices. Using these new MCUs, system developers can now quickly develop extremely powerful industrial applications with low power consumption and a wide range of communication functions. The 32-bit RX64M MCU components have a maximum clock speed of 120 MHz. Combined with the extended CPU core architecture, they produce total computing power of over 240 DMIPS when executing code from integrated zero-wait state flash memory. The MCUs also provide significantly better processing performance for computing operations, due to their integrated 32-bit multiplier, a single-precision floating-point unit (FPU), and an extended 32-bit barrel shifter. The stacks and drivers provided by port GmbH meet stringent and highly efficient coding and documentation standards, which were developed by port itself. These standards ensure that CANopen only needs a very small amount of memory while enabling high execution speeds and easy-to-read code. The company also offers active support for device certification (PNO, EPSG, CiA etc.). Customers can ensure they always receive stack and driver versions that comply with the most recent standards. The design tools from port GmbH – CANopen, EtherCAT, PROFINET, and POWERLINK – help engineers develop their applications quickly and cost-effectively. They automatically generate an object dictionary and an initialisation function in C code, an electronic datasheet, and project documentation. In addition, the tools also simplify the configuration of the libraries and the driver packages. A trial version can be downloaded free of charge at www.port.de. The stacks and drivers for PROFINET, CANopen, and Ethernet/IP are available with immediate effect. Solutions for POWERLINK and EtherCAT are also available as an on-demand option. Further information is available from Renesas Electronics Europe sales offices and from port GmbH. Port GmbH germany has revised the successful version 4.4 thoroughly. More power, more functionality - that describes the new CANopen Library 4.5 and the CANopen Design Tool 2.3 best. Whether new included modules, more supported platforms or faster program development. The CANopen extension module CiA 305 (Layer Setting Services) is now included in the library. In addition, the storing of the object directory by many new functions was simplified. This means shorter development time and faster time -to-market. Various modules have been extended and adapted to the current versions of the CiA standards. This applies in particular to the standards CiA-304 (Safety), CiA-301 V4.2 and CiA-307 (Flying Master and redundancy). With port GmbH libraries so you always meet the current standard.MISRA C is the coding standard in the embedded world. With version 4.5, the MISRA C 2004 compatibility of the library has been further improved.The CANopen Library 4.5 has been consistently optimized for processing speed down. In particular, the work with the object directory has been made even easier.The CANopen Library 4.5 supports (as well as with the previous version 4.4) over 100 different microcontroller/CAN controller and CAN platforms. Thus almost all relevant and actual microcontroller platforms are supported. Customers have now the freedom to choose your platform - software is no longer the limiting factor. "…Utilization of Real-time communication protocols in various market segments such as Industrial control, Automation, Robotics, Engine control and others, has driven throughout the years the necessity to set some industry standards in order to achieve compatibility, high reliability and maximum performances, such as CANopen, EtherCAT, Eternet-Powerlink, Profinet and others. Sightsys Ltd (Israel) develop recently a specific knowledge-center and products portfolio in order to offer its customers a complete solution of various stacks, libraries, tools and services. We are proud to add Port GmbH (Germany) as our leading company for the various real-time protocols, libraries and tools. Port GmbH, is a leading company from Germany in the area of real-time industrial fieldbus protocols and industrial ethernet solutions. Port GmbH is a perfect fit to our plans as it will be a part of our complete services and solutions to those new markets we are looking to expand. The Israeli market is expending even beyond the traditional market segments..."
Zvika Almog, Sightsys Ltd. general manager. "…We see many people who are not coming from the typical traditional CANopen, EtherCAT-like oriented industry segments, so we believe that demand for PORT's products will grow…"
“ Sightsys is the right partner for us. Now we have a partner with experience in the area of ​​field bus systems and industrial ethernet technology in Israel. We can clearly improve the local support and our customers in Israel have a local contact. For comfortable and easy configuration as well as object dictionary management, port provides its Unified DesignTool Platform which enables the user to develop communication solutions using port stacks rapidly. The individual functionality for each stack is realized by plug-ins for each protocol. So the user has only to learn how to work with one tool. The PROFINET DesignTool contains the Unified DesignTool Platform (multiprotocol solution) as well as the plug-in for port’s PROFINET IO stack. The PDNT is the first product of the new DesignTool family as "One" tool for all stacks. The PNDT offers easy creation of new PROFINET devices like Stack configuration, GSD file creation and “Keeps all in sync”. Furthermore the new PNDT allows configuration of all relevant aspects of the port PROFINET stack for Resource Management, Device Descriptions, Modules/Slots/Parameters and Driver Settings. All modules and slots are represented graphically and can be linked together. An intelligent extended User guidance is also integrated: “Follow the tasks instructions to complete your project”. The tool PNDT is available for Windows and Linux (32bit and 64bit) and requires Java Runtime 6 or higher. port GmbH strengthens its sales and support in Asia – Cooperation with Accelerated Technology Korea started"
The CANopen Library by port GmbH operates based on the communication profile CiA 301 V4.2 of the CiA e.V. " CANopen Application Layer and Communication Profile" resp. EN50325-4 and offers the corresponding services. The Library is created completely in ANSI-C and can be used with any ANSI-C comptible compiler. Press Release as PDF-Download available here. Sales Directors Heike Neumann (HEYFRA) and Christian Bornschein (port) announce the collaboration of the companies. Hirschmann / Belden and port agree cooperation in the area of embedded communication by using the Switching and routing technology of Hirschman/Belden. Pressrelease as PDF-Download also available in german, english, french and italian language.